I hide when I’m sad. Letting phone calls go directly to voice mail, declining social invitations, leaving texts and emails unanswered; I hide when I’m sad. Sometimes this behavior is healing, but when extended for long periods of time a sense of isolation sets in signaling my need to reach out to another person. Contacting someone else who’s struggling, or a trusted friend or family member reminds me I’m not alone, and helps me heal and move forward. 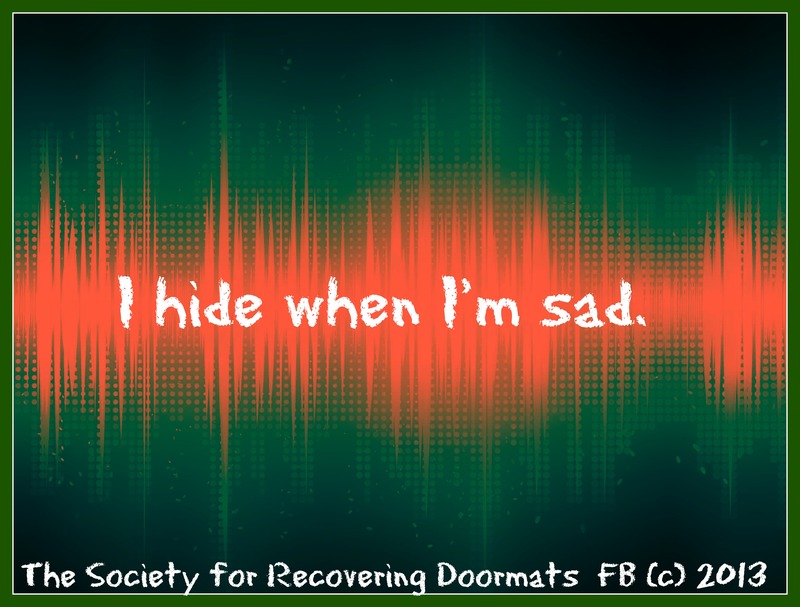 Welcome Kavin, I am so happy to see your comment here at The Society for Recovering Doormats. Greetings from Colorado! I’m bored to death at work so I decided to check out your blog on my iphone during lunch break. I love the knowledge you present here and can’t wait to take a look when I get home. I’m shocked at how fast your blog loaded on my phone .. I’m not even using WIFI, just 3G .. Anyhow, superb site! Hi, so glad you visited my blog. Thanks so much for your viewership. I’ve been surfing onlinе mοre than 3 hours todаy, yet I nevеr found any interestіng artiϲle like yoսrѕ. Thanks so much for visiting and commenting. :) Rose G.
Thanks so much for visiting. 🙂 Rose G.